GRENADA, West Indies--(BUSINESS WIRE)--St. George’s University (SGU), the international medical school on the Caribbean island of Grenada, has been recognised as an approved university by the Medical Council of India (MCI). 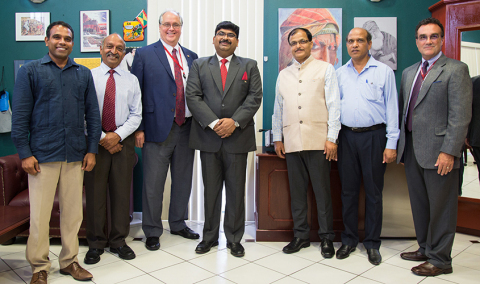 The accreditation will enable graduates of St. George’s University School of Medicine to practice in India, paving the way for Indian medical students to study at SGU and return home to practice medicine as fully trained doctors. SGU has a proven record of recruiting international students who go on to practice medicine in their home countries, often in underserved areas. Approximately 1% of all practicing doctors in the USA are graduates of St. George’s University, with that figure rising to around 15% of the physician population in Trinidad and Tobago, and 20% in Botswana. It is hoped that SGU will be able to make a similar contribution to the medical workforce throughout India. St. George’s University School of Medicine draws students and faculty from 140 countries. It is affiliated with education institutions worldwide, including the United States, the United Kingdom, Canada, Australia, and Ireland. Indian students who enrol in the MD programme will be able to take advantage of these institutional links, resulting in qualified doctors with a truly global medical education. SGU students benefit from joining an institution with significant links to the Commonwealth. In 2019 the University will host the annual conference of the Council for Education in the Commonwealth, with the theme of “investing in student success”. Participants will consider how institutions around the world can work to continually develop students throughout the course of their education, resulting in more staying on and completing their studies.